Today was a glorious day. We visited the little known but glorious American Episcopal Church, St. Paul Within the Walls, with Byzantine inspired mosaics by Burne-Jones, and tiles from William Morris. I first read about it in Andrew Lloyd-Webber’s introduction to the gorgeous exhibition of Pre-Raphaelite paintings from his private collection. 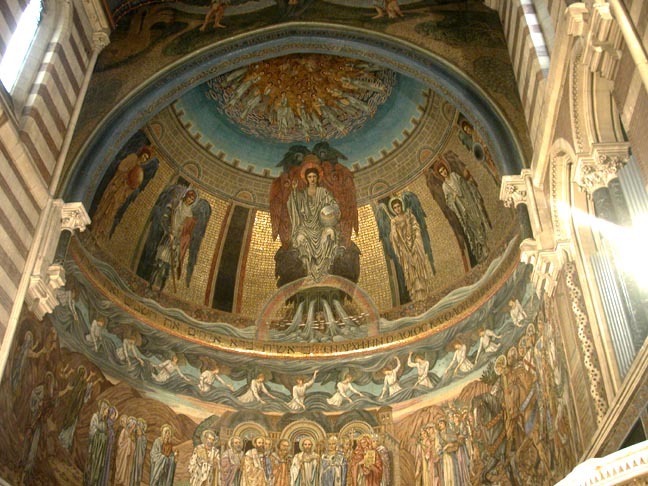 On a school trip to Rome, he slipped away, and spent the day in this American Church, getting into trouble for returning with little knowledge of Classical Rome, but much of the Pre-Raphaelites. How English! !–and arguably, how sane! I next saw Burne-Jones paintings from this project in a wonderful exhibition in the Ashmolean I’ve reviewed here http://wanderingbetweentwoworlds.blogspot.com/2010/11/pre-raphaelites-in-italy-ashmolean.html. And today, I saw the real thing. Pictures from the Victorian Web. My iPhone couldn’t do justice to it. 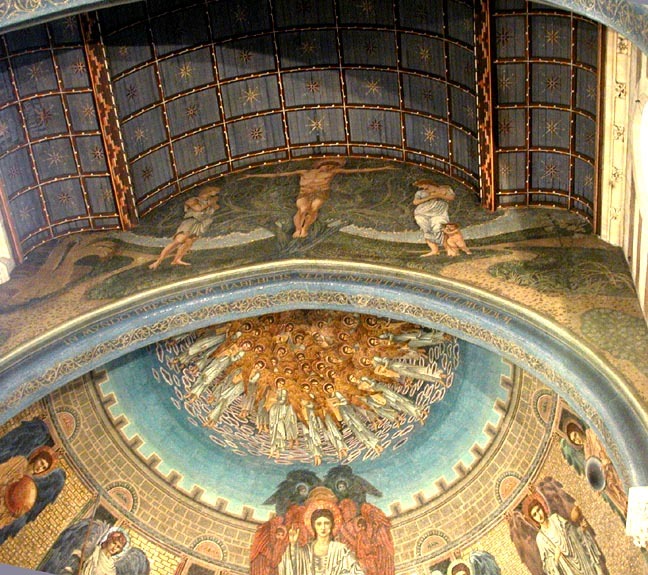 “The great mosiac of the rear wall represents Christ the Lord in glory. 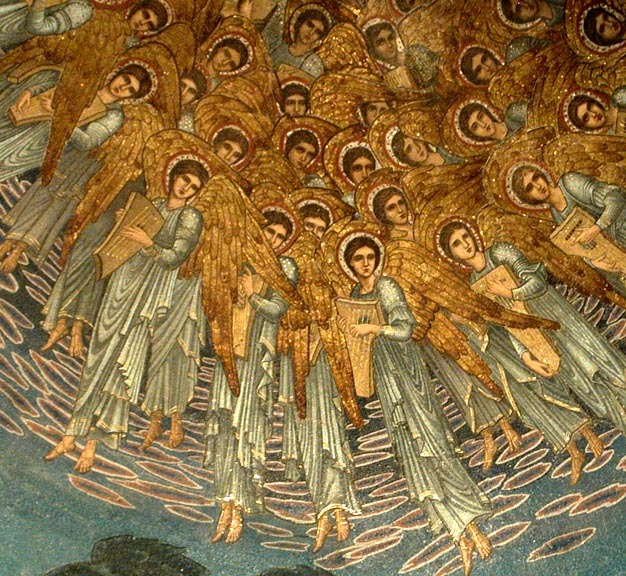 At the very top against the blue of the sky is glimpsed a glittering vision of angels. 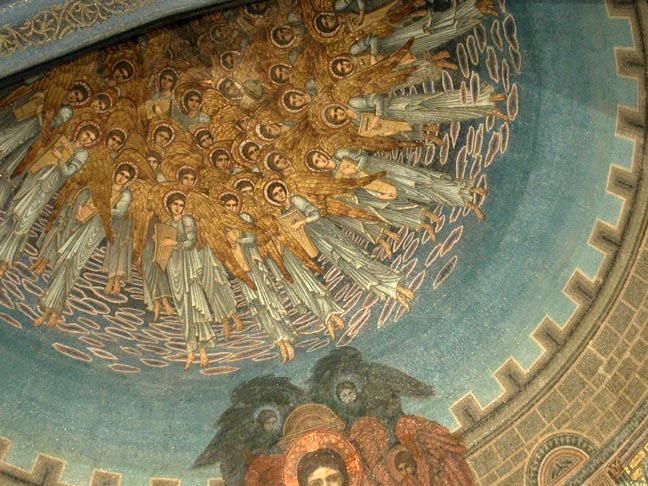 Below sits the majestic figure of Christ, enthroned upon the cherubim and seraphim. 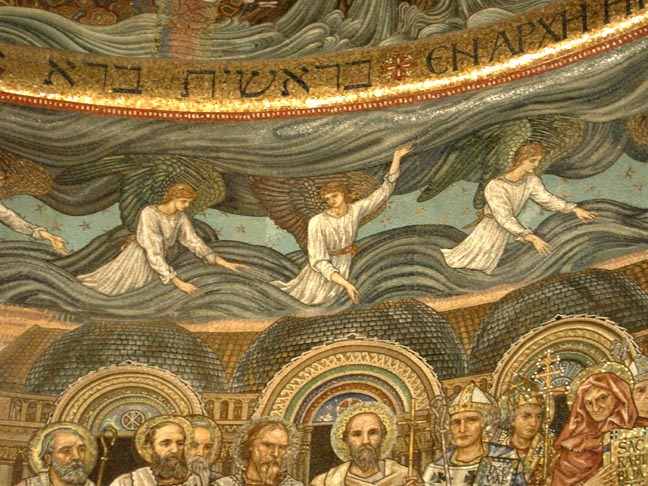 In Christ’s left hand he holds the orb of the earth and His right hand is upraised in blessing. 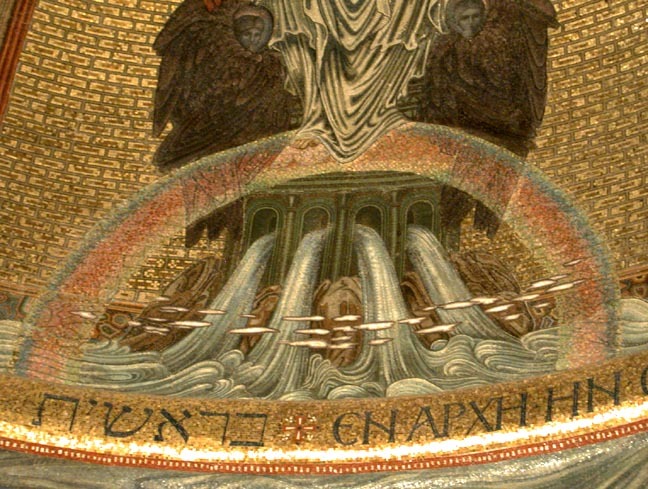 From his feet issue the streams of living water and a rainbow is ’round about the Throne’ (Revelation 4). (St. Paul’s within the Walls, pp. 2-3). We had the church to ourselves, and it was glorious. What a gift. What peace and glittering beauty. I found myself praying to have my soul flushed out and then filled with those rivers from the throne of life. See also Quest for Joy–3 Fireflies. Hi Ray, I love Burne-Jones and the Pre-Raphaelites too. There are some lovely Burne-Jones paintings at Buscot Park, Oxfordshire, a National Trust Property. Lovely!! Absolutely breathtaking. Thanks so much. I love Burne-Jones, but have never seen this before. Truly gorgeous. Thanks Penny. The American Episcopal Church, St Paul's within the Walls, only get a paragraph in most guidebooks, but it is well worth a visit. What beauty!! Thanks so much for the post! A beautiful place – I will put it on my list of must-sees if I visit Rome….